Cyclone Ashoba is located at approximate position of 18.9N and 66.3E. Due to dual centres at different levels, estimated centre may vary. Winds estimated at core are 55-60 knts (1 min sustained average), and now the track will be NW due to the Sub tropical ridge. Point to be noted is that Ashoba has been at constant strength since the last 5 hrs at least till reporting this as on 10 pm IST. At an estimated core pressure of 984 mb CI 3.7. Cyclone will now, at the current track speed, after next 12 hrs, move out of the region of "Maximum Relative Humidity" areas, and will gradually weaken. In fact there are signs of probable "choking" of the system after 12-18 hrs...probable ! Heavy rainfall from the system will commence in Oman from Thursday, 11th June. On Friday, rainfall intensity may increase, with rains spreading to Muscat. Muscat can get between 50-70 mms rain on Friday. Time Monday Morning: Shows the winds as SW below Goa (Circle indicated), where the Monsoon has advanced. 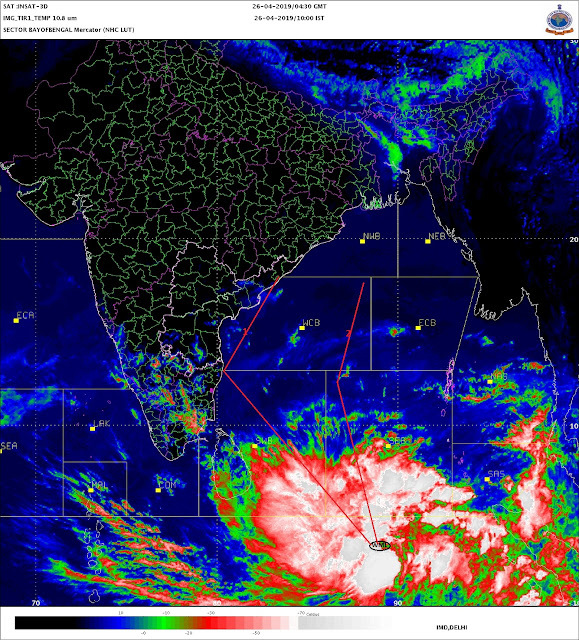 The Monsoon winds not established above 14N and outh winds influenced by AS-1 prevailing. Time Monday Night 8 pm IST: Now SW winds are stabilising into Goa and adjoining South Konkan..and will herald the Monsoon in the region, coastal only, by 9th June. 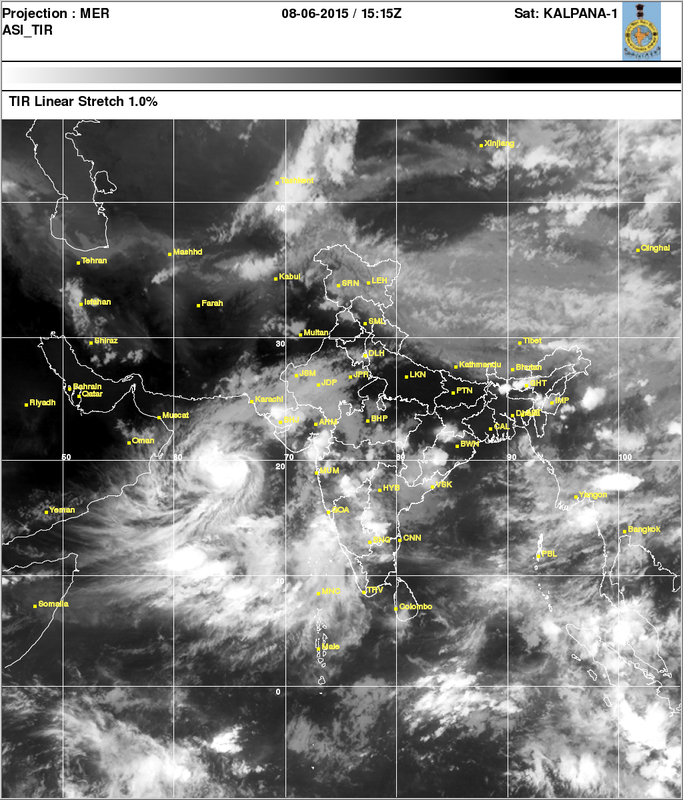 This Sat Image shows Monsoon clouds below South of Goa as on Monday night. 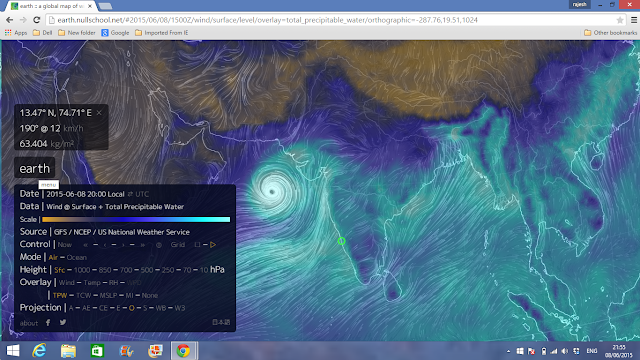 It seems Mumbai may not get much pre monsoon showers till weekend. Cyclone killed it again. Yup ..you are right..hardly any pre-monsoon showers..with just days left for the arrival of monsoon. Mumbai records 36c+ max for 3rd consecutive day today !! So June is rocking for heat till now!! As in May it didn't saw 36c for single day also.. Scruz max 36.4c today! !